….when the first leaves fall, tails and gowns see the light of day again, and the new Quadrille Ball season is about to start! The 2017 Quadrille Dancers are being chosen and the preparations for the 57thQuadrille Ball are well underway. Thanks to the generous support of our donors and guests of the Quadrille Ball 2016, the Quadrille is supporting 27 uniquely qualified American and German graduate and undergraduate students, a record number, during the 2016-2017 academic year. Of these, 17 are German majors from Columbia University’s German Department who were chosen to participate in the month long Intensive Language and Culture Studies Program at Freie Universität Berlin. 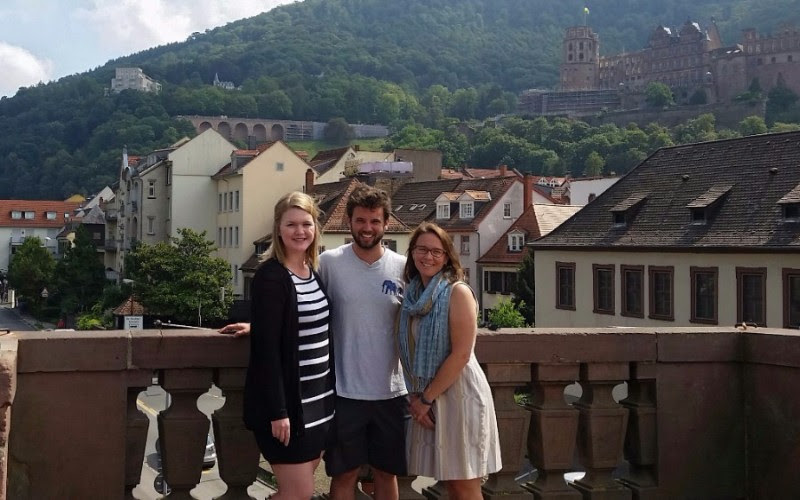 Three German teachers were selected in concert with the American Association of Teachers of German to be part of a graduate level advanced professional training at Heidelberg University (see picture below). The stipends were a gift from the University’s president, Bernhard Eitel, our 2015 guest of honor. Our third group of stipend recipients are five graduate Fulbright Fellows from Germany and two U.S. PhD candidates, whose dissertation research takes them to Germany for the entire 2016-17 academic year. Both were enthusiastically endorsed by the U.S. and German Fulbright organizations and the Institute of International Education.